I was surfing Pinterest and just saw the picture of the ugliest and weirdest Corvette I have ever seen. I think it is worth sharing it and ask you if you know something about this model or if you knew it exists? Searching a little bit, it seems it is a mix of the Chevrolet Nomad and the Corvette. The Chevrolet Nomad was built from 1955 to 1972. Looking a little deeper, there is a forum thread where someone with the same reaction I had when I saw this model of Chevrolet, posted some pictures of this weird Corvette. "I like the concept, just not the execution". "oh brother Needs to be lowered too". "Oh my, I just burped". "Can't say I really like the back end of the car." jejeej read more funny reactions here. It also seems somebody was selling just one month ago a rare to find piece of this C5 Nomad Corvette model at fincars.cc. It is a shame that the site doesn't say what was the price it was sold. As for me, I would buy this car, no way. 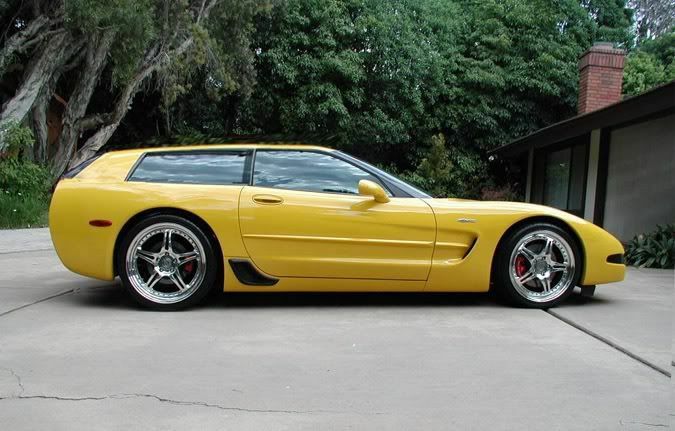 If somebody know something else of the history of this Corvette C5 Nomad, it would be appreciated. ugh! simply horrendous, what a big mistake committed Chevrolet building this horrible vehicle. I'd like to know how sales were regarding this vehicle.